Many people associate Perth with its beautiful coastline, pristine beaches and the clear blue waters of the Indian Ocean. Visitors often head to Kings Park on the edge of the city centre or down the Swan River to the port of Fremantle, both of which are well worth visiting. However just 45 minutes drive from the city centre you find yourself at the foot of the Darling Scarp, which takes you up into the Perth Hills. The Darling Ranges are home to unspoilt bushland, national parks and fertile farmland. Pretty little settlements are dotted around (including outlying suburbs of Perth). It is a wonderful escape from the metropolitan area and a very manageable full or half day trip depending on your preference. We are not talking Alps here – the high point Mount Cooke near Jarrahdale rises to 582 metres (1,909 feet) – but it is a welcome change of scenery from the flat Swan Coastal Plain in which Perth lies. We had a thoroughly enjoyable Sunday lunch and lazy afternoon the other weekend at the Core Cider House in Pickering Brook. Pickering Brook got its name from Captain Edward Picking (aka Pickering) who was one of the first land grantees in the Helena River area and settled here in the 1830s. The Core Cider House is an award winning restaurant – it has just taken out the WA Tourism Industry’s award for “Best Winery, Brewery or Distillery” for the second year in a row and has an excellent a la carte restaurant to boot. We went once before, deep in the winter, on a wild and wet day when we were huddled under blankets on the veranda (although the cafe blinds were down it was still chilly) so we were keen to experience the ambience in the spring. We went a very scenic route which included an unscheduled detour into the State Forest (caused by a slight difference of opinion between Monsieur Le Chic and our daughter and designated driver, La Chic Maman, over the correct turning)! Fortunately we got our bearings again and the Core Cider House came into view set in a picturesque hollow amongst undulating fields and orchards. You can’t bring your pets though! 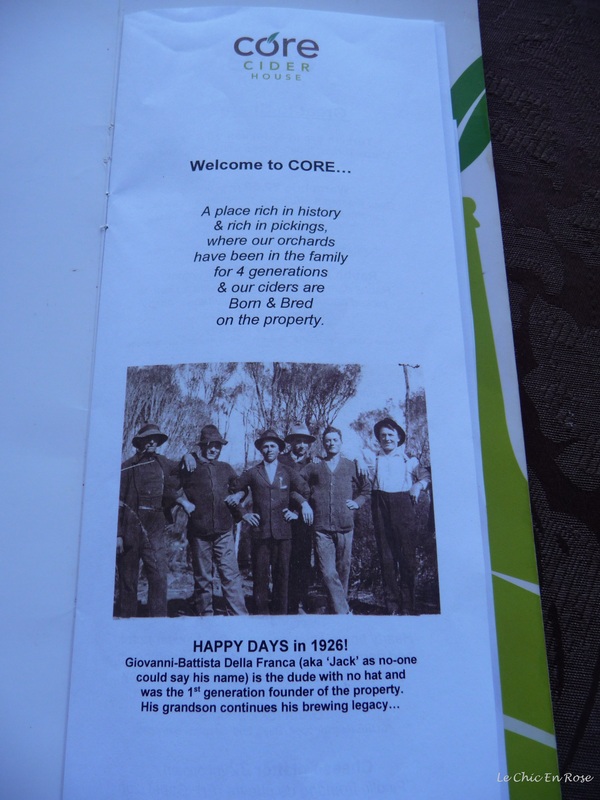 The waitress who took our order gave us a full history of the place – the Core Cider staff are very proud of the heritage. It is a 3rd generation family run business which dates back to 1939 when Giovanni-Batista Della Franca (aka Jack as no one could pronounce his name!) arrived from Italy and planted the first of his apple orchards at High Vale, Pickering Brook. His great grandchildren make up the fourth generation and will, hopefully, continue the business in future years! The family still grow all their own fruit in the orchards adjacent to the restaurant, which they use to brew the delicious ciders and make many of the tasty products that are on the daily menu. Talking of the menu this also gives you the low-down on the Cider House and its history! 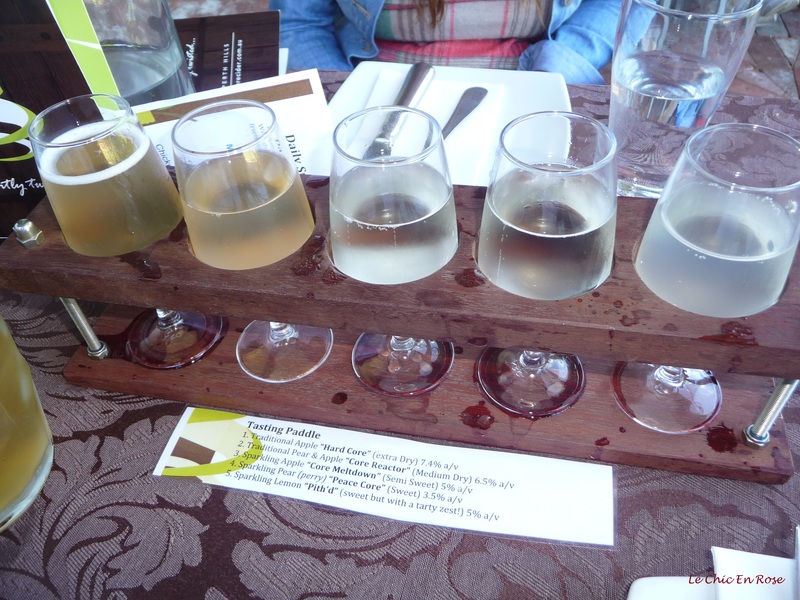 Highly recommended are the “Tasting Paddles” – a tasting plate for cider – where you can sample a small glass of each of their brews starting from the driest to the sweetest. Then you can decide which one you prefer and order a more substantial half or full pint! A word of warning though – the ciders are considerably stronger than most and you need to factor this in (La Chic Maman was the designated driver on this occasion)! Less is definitely more – you need to savour the beautiful fresh taste! The ciders are in fact a mixture of ones made entirely with apples and also “perry” made from pears. My personal favourite was the “Core Reactor” which combined the two fruits. It was superb – you can really taste the fruit! The food is equally delicious and they do serve a lot of tasting plates almost tapas style, which is probably the best option as you get a wider selection of food that way. We were entertained too by a local band (not obtrusively just pleasantly in the background) and apart from the magnificent setting looking out to the orchards, there are also plenty of activities to keep the entire family occupied. We had our young granddaughter, La Petite, with us and she had a lovely time running around the lawns, finding fruit that had dropped onto the ground and also having a turn on the old tractor that was a great drawcard for all the children. The Core also provide toys for the children to play with as their parents and grandparents eat – a great idea we thought! Not that La Petite stayed still for too long! For older children and adults alike you can always have a game of Bocce if you feel so inclined. All you need to do is ask at the bar for the balls and then you can play on the Bocce court marked out in the grounds. 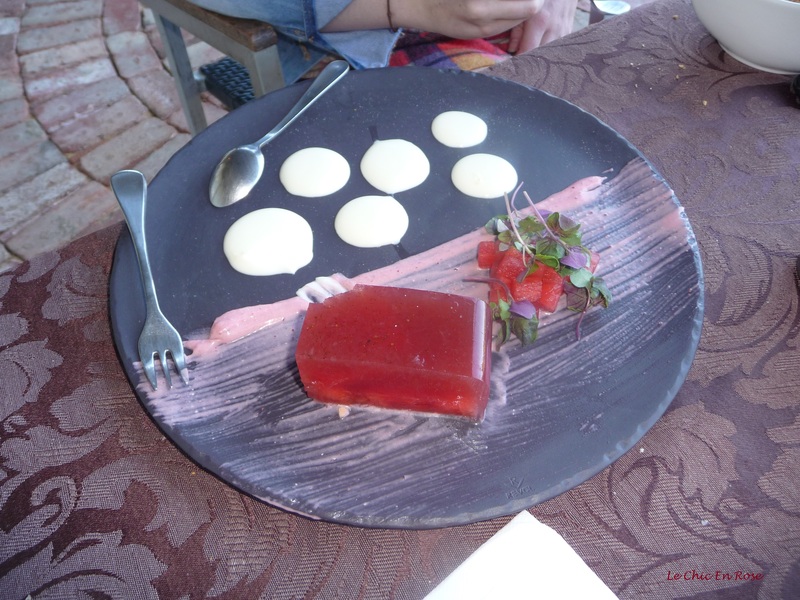 Finally La Chic Maman and yours truly couldn’t resist sharing a plate of the dessert special of the day, watermelon jelly with strawberry coulis. It tasted as sublime as it looks in the picture! Dessert of the day Core Cider House! If you are planning a visit, weekend lunch bookings are essential! You can get all the information you need here about opening times, menus, special events and function options. Salute and Ciao for now! What a perfect Sunday afternoon Rosemary – love the setting and the restaurant (big bonus that it is still family owned). Sounds like they have got everything spot on – the food, that tasting paddle (yum) and even toys for the children. Really enjoyed this post, just the thing to set me up for a wet English weekend!! Thanks Joy am glad you enjoyed it – it really is a lovely place 🙂 Sorry to hear about the rain with you though! Hope you have a good weekend in spite of the weather! My favourite cider is toffee apple. Beautiful pictures. Hope to visit one day. What fun! The whole visit looks perfect–cider seems quite trendy right now and I’m so glad–I love it! I really love your photography, Rosemary. So vibrant and revitalizing. What a wonderful leg of the journey you repainted for us. And….fabulous smile. What a lovely way to spend a Sunday, Rosemay! I’d be hiccuping my way home 🙂 I’m not especially fond of cider since my youth when I couldn’t afford much else and gave myself a thick head or two on it.